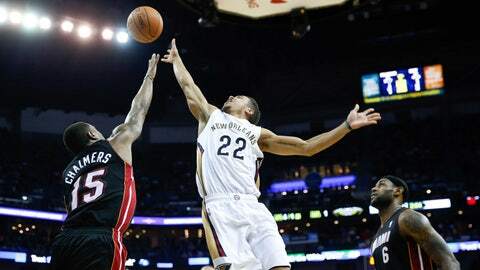 NEW ORLEANS (AP) — With breakaway dunks, putback dunks and even a banked 21-foot fade as he was fouled, Anthony Davis continued to make franchise history for the New Orleans Pelicans. Meanwhile, LeBron James played through back soreness, only to twist his ankle and see his two-time defending champion Miami Heat fall to a seventh loss in 11 games. Davis had 30 points, 11 rebounds and three steals — giving him a franchise record three straight 30-point, 10-rebound games — and the Pelicans pulled away in the fourth quarter for a 105-95 victory on Saturday night. "I don’t care what I score as long as we win," Davis said. "But if it comes to me, I’m not going to turn down any shots. Whoever has the hot hand, the team goes to them to make sure they stay in their groove." Davis, an All-Star in only his second pro season out of Kentucky, has been in a remarkable groove for someone who just turned 21 this month. He has scored at least 28 points and grabbed at least nine rebounds in eight straight games, the longest such streak since Shaquille O’Neal did it 12 games in a row with the Los Angeles Lakers in 2001. "He’s spectacular. He’s getting better every single day," James said of Davis. "When you know you’re a star and your team looks at you as a leader, as a star, you make plays and that’s what he’s doing." James twisted his right ankle while stepping on Pelicans guard Tyreke Evans’ foot during a drive to the hoop late in the third quarter. 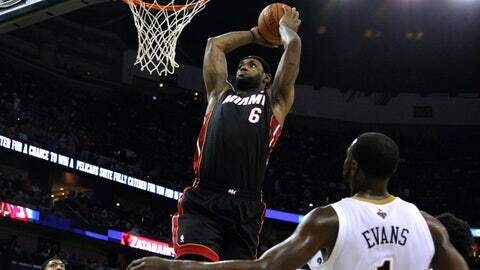 He remained in the game and finished with 25 points, nine assists and eight rebounds. It was not enough for Miami, which gave guard Dwyane Wade and center Greg Oden the night off following Friday’s victory at Memphis. "Put another injury on my list," James said. "It is what it is. I’m not using it as an excuse." James thinks the Heat already have enough of them, and his annoyance was evident. "It’s too many excuses. Everything is an excuse. We do something wrong, it’s an excuse. We don’t get a stop, it’s an excuse. We turn the ball over, it’s an excuse," James said. "What we’re doing right now ain’t good enough. "It’s very frustrating. We’re all frustrated," James continued. "We just got to all get on the same page. I don’t know what we’re going to do, but we’ve got to figure it out." One thing James made clear was that the solution would not entail more rest for him, despite his back and ankle soreness. "I don’t have time to take off," he said. "We don’t have time to take off." Pelicans guard Eric Gordon also sat out with a sore left knee, but New Orleans got 14 points from Evans, 12 from Al-Farouq Aminu and 11 from Luke Babbitt. Mario Chalmers scored 19 points and Michael Beasley 16 for Miami, which trailed for all but 18 seconds of the second half and trailed by as much as 16 in the fourth quarter. "Yes, our locker room is angry," Heat coach Erik Spoelstra said. "We’re not accustomed to this type of play, these type of standards, particularly on the defensive end, and if we want to change, we have to look inward." Babbitt was making his first start of the season and hit three 3-pointers. The Pelicans were 7 of 17 from long range and hit 51 percent (43 of 84) of their shots from the field. Miami shot 50.7 percent (37 of 73), but turned the ball over 16 times, leading to 19 New Orleans points. New Orleans, which has won two straight, also outrebounded Miami 38-33. Toney Douglas started for Wade, but was called for his fourth foul after turning the ball over to Davis early in the third quarter and played only 13:52. The Pelicans led 76-72 after three periods, but began to pull away early in the fourth even as Davis was resting on the bench. Anthony Morrow, who had 10 points, hit his second 3 to give New Orleans an 85-76 lead with nine minutes left. Davis checked in shortly after, and put the Pelicans up 92-78 on a 21-foot bank shot as he was fouled by Chris Andersen. Miami opened the game on a 10-2 run, which turned out to be its biggest lead of the game. Then the Heat got sloppy. The Pelicans scored off of turnovers by James, Udonis Haslem and Chris Bosh during a 15-3 run, highlighted by Davis’ steal from Bosh for a breakaway dunk. Davis had 14 points in the first half, and his putback dunk put New Orleans up 43-38 before Ray Allen’s 3 and James’ 19-foot fadeaway helped pull Miami to 45-43 at halftime. Notes: The Pelicans’ victory was their first over Miami since November 2010. … Bosh finished with 12 points for the Heat and Allen had 10.